Visual Studio Code>Programming Languages>ColorTabsNew to Visual Studio Code? Get it now. ColorTabs now changes the color of your status bar (set to true by default) - PR #10.
set colorTabs.statusBarBackground to true in your workspace settings to get this new feature. ColorTabs can now change the color of your activity bar (Left side bar) - PR #10.
set colorTabs.activityBarBackground to true in your workspace settings to get this new feature. ColorTabs can now add a label to your title background as well - PR #4. ColorTabs can now color your title background as well - PR #2. Working on a monorepo, this extension can help you quickly understand if the current file is where you want to be. 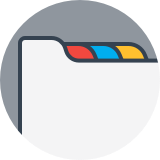 For example your repo has both server and client, so this extension will color the client file tabs in one color, and the server file tabs in another. With this extension you can easily differntiate between the two. And BOOM - your build files are now in red. No more mistakes!